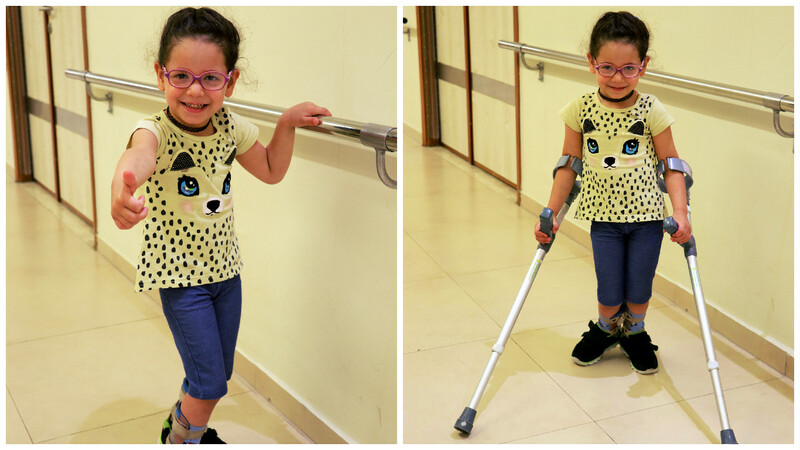 It is the thirteenth admission for Mira Masri into the rehabilitation program at the Jerusalem Princess Basma Centre. Mira is four years and seven months, diagnosed with Cerebral Palsy as a result of placental abruption from her mother’s uterus prior the delivery, causing Mira’s mother to suffer a severe bleeding. The critical situation obliged Mira’s mother to have an immediate c-section, in order to deliver her baby girl. Mira, weighing less than 900 grams, stayed in the incubator for neonatal care for almost two months and was connected to an artificial respiration machine. Making things worse, a feeding tube was inserted into her stomach deforming Mira’s soft skin. Five times is the total number of operations Mira’s little body had to endure. Her mom explains “Mira’s actual age is less than the number of surgeries she has undergone throughout her life”. This included Retinal Cryopexy surgery, another one to fix a congenital heart disease, followed by a hernia repair and a critical surgery in the leg’s tendon. Razan, Mira’s mother shares her story “When Mira was 9 months old, I noticed a delay in the development of her growth.” I took her to “Farah” clinic in Nablus where Dr. Waddah Malhis and a multi-disciplinary team from the JPBC diagnosed her, and requested to run some tests and transferred her to receive comprehensive services at the JPBC before she even completed her 13th month. I remember well every admission Mira went through and the positive results she achieved after every rehabilitation cycle. The progress in Mira’s condition was attained after she had received therapeutic services at the Centre with my company to all her therapy sessions, in addition to performing certain exercises I was trained to conduct through the customized home-program provided by the Centre. Razan continues” At first, Mira started lifting her head, and then she began sitting alone and belly crawling, and gradually shifted to hand/knee crawling. Later, she started moving her legs, and slowly started walking assisted by the kay walker which helped her move between rooms and to the bathroom. The improvement in her physical abilities was accompanied by development in all other fields including, cognitive, linguistics and communication skills in addition to becoming independent in various daily activities. Therapists who have worked with Mira say that she first came to the Centre with sensory, physical communicative and linguistics difficulties, in addition to behavioral problems related to social interaction. Regarding to Mira’s physical problems, she had motor developmental delay in her lower limbs, weakness in trunk muscles and in balance when sitting. She also suffered a delays in protective reaction, problems in sitting, crawling, and standing up. On the occupational level, Mira had sensory problems, difficulties in fine and gross motor skills that disabled her from grasping things in both hands. Adding to this, Mira faced problems in daily life activities including her dependency on others while doing her things. However, Mira walks at home alone now without anyone’s help at home. She uses the crutches at the kindergarten but she is in independent in most of her daily activities exhibiting a huge progress to be integrated to be enrolled in the primary level at school. “At the beginning of the admission, Mira showed delay in her communication, linguistic and expressive progress, oral cavity problems, in addition to delays in her cognitive skills. After receiving treatment at the Centre, Mira’s communication and even social skills progressed in a remarkable way. Her speech began to be understandable. Her sentences became long. She is even capable of telling stories”, Speech and language therapist Hadeel Saideh comments. Razan tells how relatives and friends were discouraging and disappointing “A girl with a cerebral palsy can’t achieve anything of this sort”. Others discouraged my attempts to help Mira and my trip all the way to Jerusalem to seek rehabilitation and treatment. Only therapists at Princess Basma Centre stood with my back and filled me with their contagious hope. Indeed, I started accompanying Mira and learn as much as I can from her treatment sessions. I memorized all the exercises and applied them at home. My husband couldn’t believe the progress Mira achieved. I even taught him and my eldest daughter Laura how to do certain exercises to ensure Mira’s development”. Mira has a unique smile that doesn’t leave her. She loves taking “selfies”, making different poses on the camera and capturing happy moments on her mother’s mobile. Mira got recently enrolled in a kindergarten in Nablus and was integrated in the same class with the rest of her peers. She takes the kindergarten bus every day and lives her daily life overcoming all the obstacles, the physical ones but most importantly the social obstacles society has created. Razan says “Mira’s progress has exceeded everybody’s’ expectations. I will continue following up with her and training her until she becomes a fully independent productive person. Mira’s success story falls under the support given by “Embrace the Middle East“. 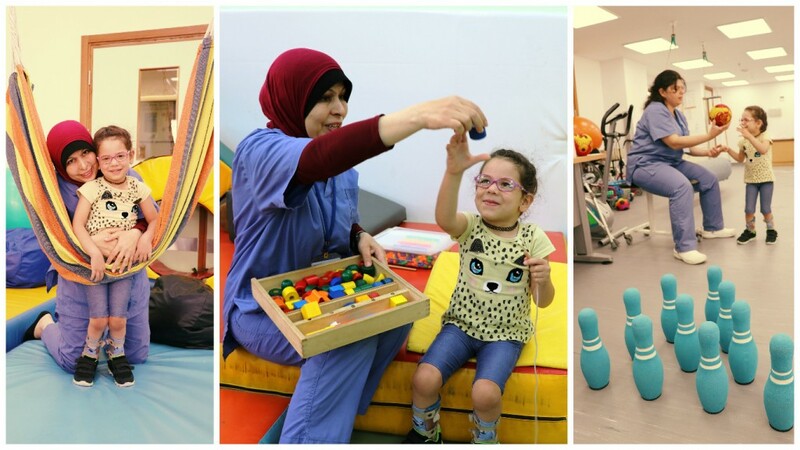 The program provides rehabilitation services for children with disabilities in the West Bank and fosters the network of partnerships with rehabilitation centers in the society. The program aims to raise awareness of disabled children in Palestine, transfer them for the specialized rehabilitation program, and empower their mothers through the treatment and rehabilitation process.